Today marks the one year anniversary of my very first Power Line post, and as it happens I can mark this august occasion with the same subject as the first post: monster trucks. Sure enough, while John was out shooting for relaxation this weekend, I was taking in the Advance Auto Parts Monster Jam at the Verizon Center, a sport which also requires you to wear ear plugs. This year’s Monster Jam tour features the 30th anniversary of the trailblazer of the sport, the legendary Grave Digger. And once again, Grave Digger came away the winner in the premier event on Saturday afternoon, the freestyle competition, edging out Monster Mutt in the scoring by just one point! 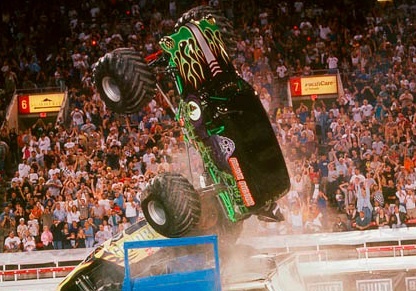 You can be forgiven for thinking that monster truck freestyle competition is rigged in favor of Grave Digger, and that the other trucks are the axle-equivalent of the Washington Generals basketball team. But the Digger doesn’t always win. Sometimes the truck breaks an axle, blows a tire, or flips over, and someone else wins. So now it’s on to World Finals in Las Vegas in March, where Grave Digger will face off against its arch nemesis, Maximum Destruction.